When most Manhattan real estate developers buy up land to build a new tower, they unceremoniously raze any existing structures. But Michael Shvo, a developer and art collector who recently bought a lot near the High Line with the intention of building a new residential tower, decided to have a little fun first. 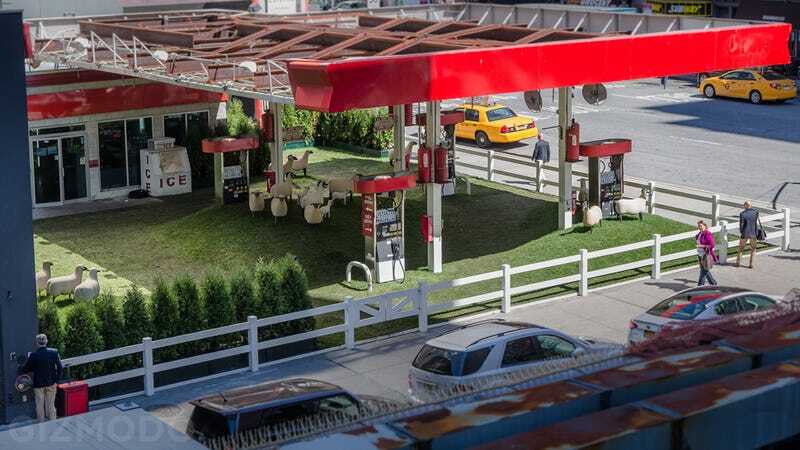 This year, Shvo is commissioning artists to turn his future tower—currently occupied by a gas station—into art. His so-called Getty Station will showcase many exhibitions over the coming months in the Chelsea neighborhood of Manhattan. The current exhibition, presented by the Paul Kasmin Gallery, is called Sheep Station for obvious reasons. It's an installation by the late French sculptor Francois Xavier Lalanne, who first debuted the pastoral piece in 1965.